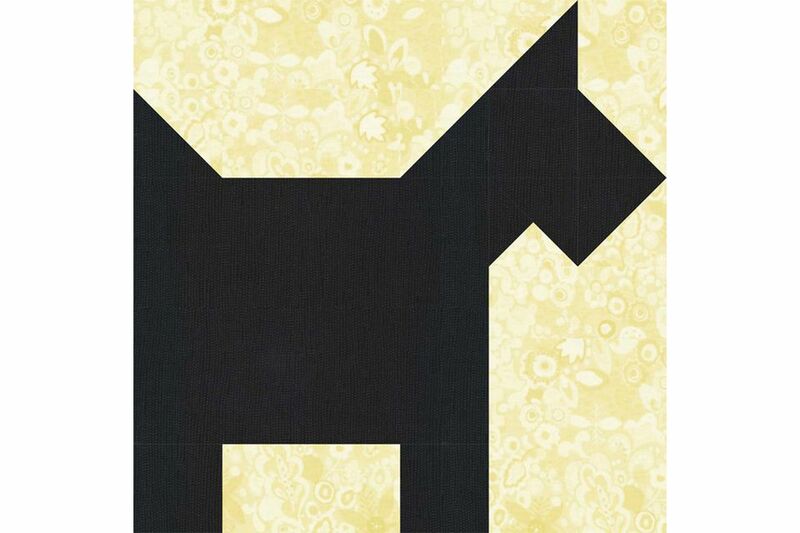 The traditional Scottie Dog quilt block pattern is assembled using a combination of squares, bars, half-square triangle units, and a quarter square triangle unit. 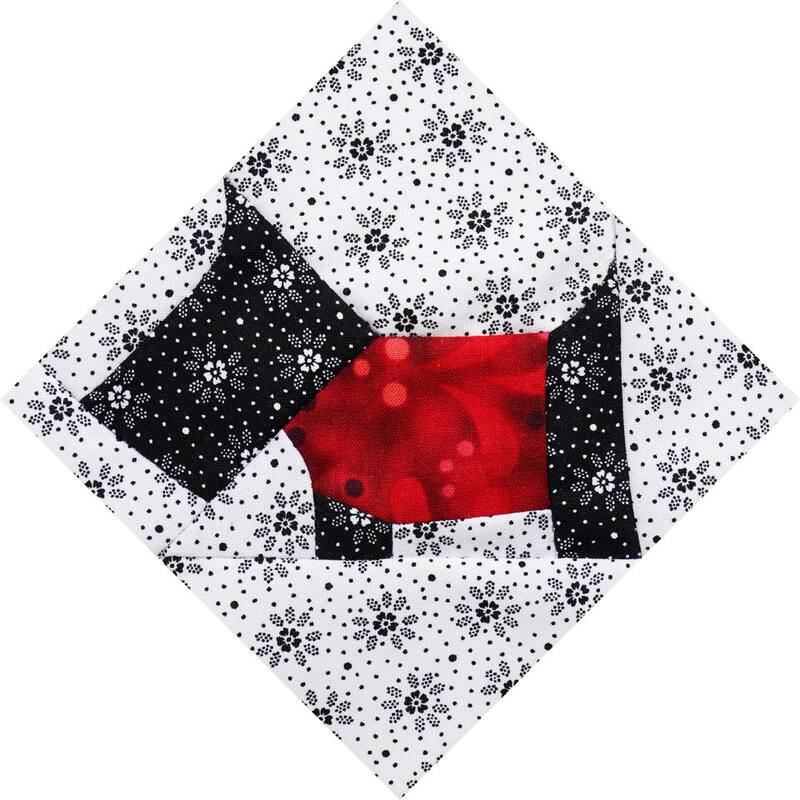 The fabric for this patchwork Scottie Dog is rotary cut and quick pieced. We used only two colors for the Scottie Dog but change fabrics in any way you wish. Make the little Scottie in realistic colors or try a small scale dog-themed fabric for either the body or background. Beginning quilters—learn how to cut patchwork shapes before you work on the quilt block. Half square triangle units are used to create the Scottie Dog's head and tail. Pair a 2-7/8" x 2-7/8" background square with a black square of the same size. Use our easy quick pieced method to sew the squares together, creating two half-square triangle units that each measure 2-1/2" x 2-1/2". Make four more half square triangle units by pairing two 2-7/8" x 2-7/8" background squares with same-sized black squares. Make two half square triangle units by pairing the 3-1/4" x 3-1/4" background square with a black square of the same size. The units should measure 2-7/8" x 2-7/8". Try the magic 8 half square triangle method if you make lots of identical Scottie dog blocks. Quarter square triangle units are easy to make. Before you begin, read through our quarter-square triangle instructions to get a feel for the basics. Find a half square triangle unit made from 3-1/4" squares. Draw a line from one corner to an opposite corner on the reverse side of a 2-7/8" black square. Pair the plain square with the half square triangle unit, right sides together and aligned so that the marked line is perpendicular to the triangle square's seam. Sew a seam 1/4" on either side of the line, just as you did to construct the half square triangle unit. Cut on the marked line and carefully press the quarter square units open. Units are mirror images of each other. Refer to the illustration to see which one is used for the right-facing Scottie. The remaining unit can be used to sew a left-facing dog. Assemble the pieces for the Scottie Dog quilt block in two large sections, a left, and a right, and then sew the sections together. The left section is made up of four rows. Row one is the 2-1/2" x 8-1/2" background bar. Make row two by sewing a 2-1/2" background/black half square triangle unit to each end of a 2-1/2" x 4-1/2" rectangle as shown. Press seam allowances towards the bar. Row three is the 6-1/2" x 8-1/2" black bar. Make row four by sewing a 2-1/2" x 2-1/2" square to each end of a 2-1/2" x 4-1/2" rectangle. Press seam allowances towards the darker fabric. Sew all four rows together. Press seam allowances towards the plain bars. Make row one by sewing a 2-1/2" black/background half square triangle unit to a 2-1/2" background square. Press seam allowance towards the square. Make row two by sewing a 2-1/2" black square to a 2-1/2" black/background half square triangle unit. Make row three by sewing the quarter square triangle unit to a 2-1/2" black/background half square triangle unit. Refer to the illustration to choose and place the quarter square unit. Press seam allowance towards the half square triangle unit. Row four is the 4-1/2" x 6-1/2" background bar. Sew the rows together. Press seam allowances towards row two and row four. Sew the left and right Scottie sections together, matching seams carefully. Press. The quilt block should measure 12-1/2" square. If yours is a different size or skewed, try one of our easy methods to square up quilt blocks. Use the cat quilt block pattern to design a quilt filled with canine and feline friends.